Khris Middleton bounced back from a poor shooting night against Houston and scored 39 points, 24 of them came in the second half, on 16 of 24 shooting. Antetokounmpo added 34 points and all five Bucks starters reached double figures in the win. Eric Bledsoe and Sterling Brown had 15 points each and Brook Lopez added 12 points, helping the Bucks wrap up a 4-0 home stand. 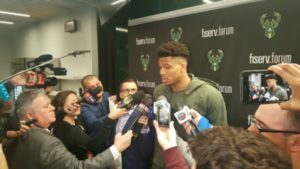 With the Bucks drawing closer to clinching the top record in the league and top seed in the playoffs, coach Mike Budenholzer will have to consider how he handles giving his players some time off with their health in the playoffs in mind. The Bucks have Friday and Saturday off and will face the Hawks in Atlanta on Sunday.